Going Downhill Fast VERY SLOWLY…. 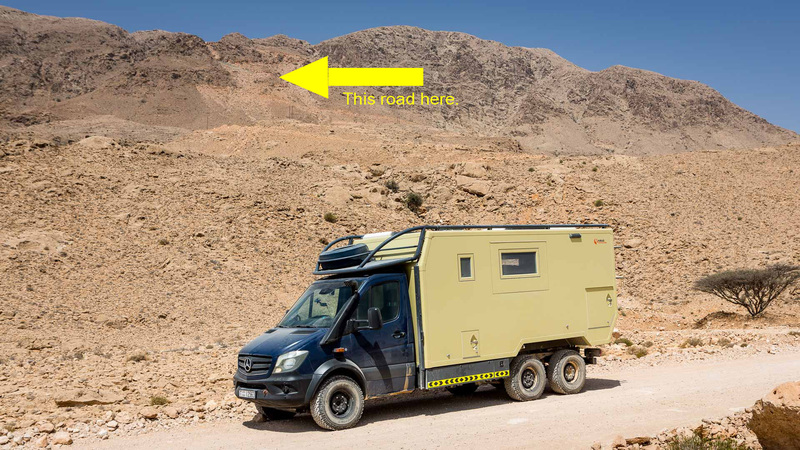 “Steep” doesn’t begin to describe the road I had to drive down to return to the main coast road running between Sur and Muscat in Oman, from the Salma plateau where we’d been camped for a couple of nights to escape the high temperatures. “Very steep” and “very tight” would be more accurate, especially given TTT’s length, weight and large turning circle. A turning circle which, I discovered, could however be minimised – provided you were facing straight down a mountain and the rear axle, now with less weight on it, could slide gracefully round the corner after losing its grip on the concrete surface. Now I’m a big fan of Guns ‘n Roses, so as far as I’m concerned, Axl Rose is a good thing. Axle rose (and slid round)…..less so. Not so much Mr. Brownstone, more Mr. brown trouser. From a physicist’s point of view this novel approach to swinging the back end of TTT round a corner whilst facing the drop off the edge of a mountain, was probably very exciting. From the driver’s point of view, I can assure you it was also a very unpleasant experience. But you can judge for yourself in the video below – the first of several ‘axle slides’ starts at around 9:30 but don’t just jump there – if you watch the earlier clips you’ll have a better idea of the altitude from which I’m descending, just how narrow the road was in places, and how much quicker a Land Cruiser pick-up, four tonnes lighter than TTT and driven by a guy who probably navigates that road several times a week, can descend the same path. We agreed before setting off that my friends Streaky and Manuel should go on ahead of me, because we all knew how slowly I’d have to negotiate the road, and that I’d consequently hold them up. That turned out to be wise move when you consider that it took me more than an hour to drive the steepest part of the route – a journey of, I think, less than five kilometres. (I wish I could be more accurate but forgive me, I was concentrating on the driving, not the odometer!). All I know is that G.O.I.N.G S.L.O.W.L.Y. was the order of the day. Should you wish to drive down the same road, (presumably because you have some sort of mental imbalance which requires you to do daft things even though you’ve seen the video! ), you’ll have to negotiate your way to the following GPS coordinate: N 22.871113, E 59.177051. Good luck with that. Take a change of underwear. Routes, Vehicles mountain, Oman, vanlife, wanderlust. Hi Tim – glad to see you out in the dust with the “beast”! I can imagine how easy the words been spoken. Crawling down the road was very impressive – started to sweat at some point. I wish from heart you can conquer more roads and your plan comes true one time. Yes it’s great to be using TTT at long last. I’ll be on holiday in the UK for a few weeks from next week – hope to see England win the World Cup while I am there….”maybe”….. but when I get back, will be busy preparing for some more trips. Hope to make some more videos soon. Been following your blog, looks like you are having fun 🙂 I wanted to ask you a question on your vehicle, is it all going well, no issues? The reason I ask, is I am thinking about either buying what you have or leaning towards the MOG, the U4023. Compared to what you currently have? Please see my detailed reply in your email. I did have issues early on with the chassis but those have been dealt with. I’ve had further problems with the auxilliary fuel tanks installed by Hellgeth. I had to fix those myself and am unhappy with a number of issues regarding that installation, but there’s more detail in the email. Can’t comment re. the Unimog as I’ve no experience of it. I like the look of the Bocklet – it’s similar to mine but my cabin was built to a very specific design spec by Krug and they made an excellent job of it. Hi Dirk. No, things just haven’t gone according to plan, life wise, to enable me to leave. Happy to read the Steyr is more nimble than TTT. Most things are! Good to see that you could put TTT’s wheels in Oman! Like you, I know the feeling of trying to hold 5-6 tons of truck on a steep downhill! Unlike yours, my nimble truck is quite happy on sharp curves. Hi Bernard! Happy New Year to you – your journey through “The Stans” looks amazing. Yes Oman was fun in places, scary in others. And the AC was needed in August in the Wahiba desert, that’s for sure. No news about my departure date yet but I live in hope!